With the current Ferrari market on fire, there are only a few models that can be purchased by mere mortals. The 1986-1989 328 GTB/GTS is one of them. The 328 was an evolution of the 308, but it had a larger engine and enhanced styling. Over 6,000 were made (with over another 1,000 Turbo models also made). But, as you can see, this is no ordinary 328 GTS. Built in 1993, this car is based on a 1989 328 GTS (which was the Targa model). The body was constructed by Bernd Michalak Design Studio of Germany and is all aluminium. It still has the same engine – a 270 horsepower, 3.2-liter V-8. Top speed is reportedly over 170 mph. One intriguing part of this design is the fact that the car has no doors. You’re supposed to just step into the car (there isn’t a roof either – or roll bars – so you can’t do a Dukes of Hazzard-style entrance either). It does come with helmets for the driver and passenger though. First presented at the 1993 Frankfurt Motor Show, it appeared the following year at the Geneva Motor Show as well. It bounced between owners on either side of the Atlantic before the current owner bought it in 1999. Major service was carried out in 2014 and it is road legal (at least in Belgium where it is currently registered). Looking like a cousin of the Ford Indigo Concept Car of the mid-1990s, this car has covered approximately 6,000 miles since it was built. It’s obviously a one-off and is being sold without reserve (or a pre-sale estimate, though it should easily set a record for a Ferrari 328 at auction). Click here for more info and here for more from this sale. Update: Sold, RM Sotheby’s Monaco 2018, $128,811. 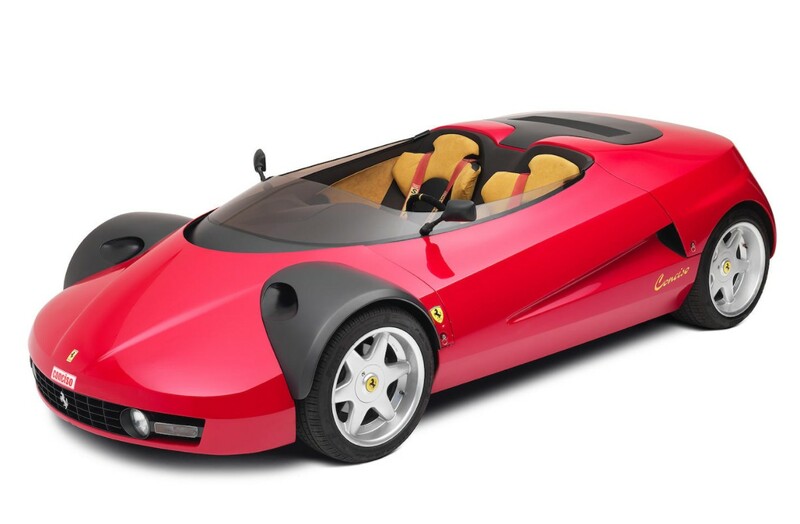 This entry was posted in Uncategorized and tagged 1989, 328, auctions, Bonhams, cars, classic cars, concept car, conciso, ferrari by classiccarweekly. Bookmark the permalink.